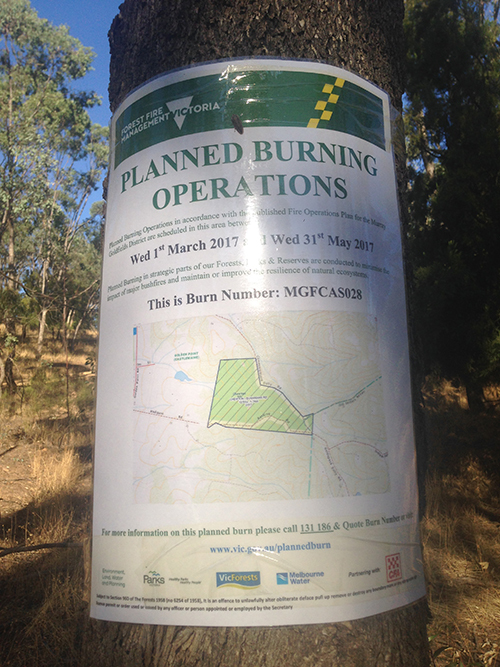 The bushlands reserve on Commissioners Gully Road is now subject to a proposed planned burn sometime between 1 March and 31 May 2017. The reserve was previously subject to a proposed asset protection burn (triggered at the request of a neighbour) that never took place. We will post updates on the burn status when available. If you have any further queries then contact John Hosking from the Department [m: 0407 438 092 or w: 54704 0056]. This entry was posted	on Monday, February 27th, 2017 at 2:56 am	and filed under Fire. You can follow any responses to this entry through the RSS 2.0 feed.